This week the trials began: the trials of Catalonian political prisoners in Spain, on trial for crimes of ‘rebellion’ and ‘sedition’. Let’s just pause to reflect on this. We have a leading European state putting 12 people on trial for peaceful political activities. All 12 were either elected or legitimately recognised political leaders representing the majority in Catalonia. And they have already been in jail for 17 months or so. Although the offences are ‘rebellion’ and ‘sedition’, they are on trial for organising a plebiscite that was also supported by the majority of the people. They are on trial for organising a vote against the wishes of the sovereign. You have to pinch yourself. This is in Europe. In the 21st century. Human Rights Watch has condemned the violence of the Spanish Police (though it has not yet been accused of hate crimes) and Amnesty International has officially asked to be an observer at the trials. This comes a matter of months after the European Court of Human Rights ruled that the Basque political prisoner Arnaldo Otegi was not given a fair trial. So where is the mass mobilisation in Europe to stop this trial that makes a mockery of basic human rights standards? Where are the solidarity demonstrations? Why is this not being scandalised in the European press? One reason is that it has been very easy to dismiss the Catalan crisis as a backlash against “Catalan nationalism.” It is less easy to face the reality: that a particularly ugly form of Spanish nationalism has risen to the surface of politics. This is a form of nationalism that has empowered the extreme right, like the VOX movement in Andalusia. Recall that VOX’s most prominent demand was to further rescind the autonomy of the Catalan parliament. Three weeks ago, the left-wing mayors of two Catalan towns of Verges and Celrà were arrested in a dawn raid along with, a journalist from the magazine La Directa and 13 other activists. They were arrested for organising peaceful protests demanding the release of political prisoners. In the past few months, politicians, teachers and fire fighters alike, have been charged by the authorities with “hate crimes” and “discrimination” against “the Spanish nation and the corps of the Guardia Civil.” Numerous ordinary people who have dared to condemn police violence – or even talk about it in public – have been hauled in front of the judiciary, facing prison for “hate crimes” against the Spanish state. The Catalan crisis has become a key battleground preserving the dominance of the Spanish government and the financial oligarchy. Of course, not everyone on the left supports self-determination for Catalonia. But the origins of the current struggle are in the anti-austerity movement and Spain’s attempts to quash it. This struggle is exemplified by the modification of the Spanish constitution in August 2011. This modification – introduced as a consensus between the ruling PSOE and the PP in opposition – came in the form of Article 135 which amended the constitution to guarantee the repayment of the public debt above any other social spending. This economic ‘stability’ measure was key to ensuring the primacy of the interests of the Spanish banks and foreign capital investors as a matter of social priority. The right to profit was effectively secured even when so many of the beneficiaries of this measure were widely known to have been routinely engaged in fraud in the run up to the crisis. Since 2006 more than 40 laws passed by the Catalonian Parliament have been blocked by the Constitutional Court using the argument that the Parliament has no competency to legislate on such issues. In reality, the Court has been crudely and deliberately narrowing the boundaries of the Catalonian Parliament’s competencies. Most of the blocked laws were concerned with securing social rights and protecting people against impact of austerity. The most striking of these blocked laws was one that banned the eviction of people before they were offered social housing and included a measure to protect the vulnerable against their water and electricity supplies being cut off. This law had cross-party support in the Catalan Parliament. Other interventions included outlawing measures on gender equality and climate change. The movement for Catalan independence at the same time contains the seeds of a real, economic and social, self-determination. As we noted in an earlier piece for The Guardian, the ‘solidarity’ economy has been developed by locally-based social movements in Catalonia for at least twenty years, but the economic crisis and the relatively recent political project of municipal socialism has boosted its momentum with an explosion of initiatives and projects. At the same time, it is much more difficult to explain why the rest of Europe has tolerated this. It is much more difficult to explain why there are political prisoners on trial. In Europe, in the 21st century. Bella Caledonia’s “Building a New Catalonia”, edited by Ignasi Bernat and David Whyte is available from Lighthouse Books here. Puigdemont received 5 letters from the Spanish Constitutional Court stating that his plans were illegal and carried the risk of heavy penalties, including prison. His response? Pose with them for a photo and Tweet that he was going to ignore them. Now, maybe Ignasi Bernat and David Whyte want to live in a country where the government thinks it is entitled to ignore the judiciary. And maybe the majority of BC want that as well. But I don’t think the idea will ever be palatable to the majority of Scots. When the judiciary itself is part of the problem, then, yes, you do have to challenge it, too. Any state that uses the judiciary as its front-line defence against democracy – as happened in Nazi Germany (Nuremberg Laws?) – it is incumbent upon the international community to condemn such behaviour. So far, from what I can glean from the rulings by the UK Supreme Court, its rulings have been within the parameters of (English) constitutionality. The problem there is that the entire ‘British’ Constitution is wholly English, and a number of its precepts are anathema to Scots Constitutional Law (against the precepts of the Treaty of Union 1707) and it also limits devolution to an extent not envisaged by any constitutionalist. At no time, in any sphere, in any way, did the Scots agree to become England’s constitutional subjects, forsaking their own laws and jurisprudence. The Treaty of Union actually proves that to be the case, so, Block, you are way off-beam here. That the EU has not condemned Spain’s actions is breathtaking now that it has condemned the Venezuelan regime without condemning American sanctions, which hurt the poorest the most. It has no right to interfere in the domestic affairs of member states, but Spain is actually breaking international law, not least on human rights. The UN, whilst it has condemned the use of force, has not intervened either. It is absolutely necessary for the observers to be at those trials. All you are doing is saying that if you support the government, then you support the government defying the judiciary. Few people will agree with you. And, for the record, the EU, via its Venice Commission, sent a letter to Puigdemont telling him to work it out with Madrid. Kenny, I like the way you marshall facts & logic to make your points – you are definitely someone whose opinion is worth seeking out. It’s an old post, but still. You say “maybe Ignasi Bernat and David Whyte want to live in a country where the government thinks it is entitled to ignore the judiciary.” When state politicians abdicate responsibility for solving problems and hand the job to judges who just happen to be elected by politicians in Spain, I think you might honestly doubt the wisdom of always obeying the judiciary. I hasten to add, not necessarily disobeying the law. Why has the rest of Europe tolerated this situation? People are naïve to think that the mighty EC and it courts are on the side of the angels. Or of justice. The Catalan rebels will be strung up as an example to deter any other groups from upsetting the harmony of the Brussels brigade. Which is why so many Scots leavers, like me, want an independent Scotland …but outwith this EC crooked circus. This is the elephant in the room which will pop up if and when Nicola announces a date. You claim you want independence but “ outwith this EU crooked circus`. The UK is as crooked as Fagin and has been lying and robbing Scotland for 300 years and is still doing so. Its just a tad odd that as an indy supporter you haven`t mentioned that. No. They organized a vote against the Spanish law. Not even the SNP acted that recklessly, patiently waiting until Westminster gave their permission. They would have not dared do it against Westminster. If we were to believe Nicola’s views, why is she not calling for that so long promised IndyRef 2 against Theresa May’s? But no, she is patiently and cowardly waiting for Westminster to allow it. At least these Catalans were brave. Reckless but brave. Which is the right move as the Catalan parliament has not done anything within it’s duties marked (again) by the Spanish law. As an example, between Aug17 and Sept18 not a single law had been passed or discussed in the Catalan parliament. The very British government has suspended N.Ireland autonomy several times, including a spell of five years between 2002 and 2007. This is a common practice when an autonomous region “misbehaves”. No. They were arrested for blocking the High Speed rail tracks last October. They were reported by ADIF, the company that manages those resources. See above my comments on the origin of the current struggle. Do you have any example of these? Remember that Catalonia is one of the most (if not the most) autonomous regions in Europe, having even their own Police force! I am afraid i do not know those two gentlemen. On more important issues, discrediting a different opinion, tho backed with some facts (uuuuuh) is kind of fascist on your side, isn’t it? Or am I missing a hidden meaning of “trolling*? Hi Ed, I just quote from the introduction of a book on British law – “Common Law and Modern Society: Keeping Pace with Change” (Mary Arden, 2015, OUP) “Law is a lasting social institution but it must also be open to change. … the focus here is on how the law operates …. Section A looks at the way judge-made law responds to the changing needs of society, arising from changing social values, constitutional shifts or the need for a better legal framework in a particular field. Section B deals with simplification of the law and its systematic reform, including codification. In other words, give law its due as a servant to society, not just by drawing boundaries, but by studying and moving these as appropriate when society struggles with the status quo or leaves it behind. Sadly Spain has got stuck recently. Hence many of current problems. To put it another way, putting the geni back in the bottle was always a losing game. Food for thought. And a note: the author does not mention a quirk of Spanish criminal justice: any private individual or body even if not directly involved can join the public prosecutor and state advocate as a party in a prosecution. In the Catalan case, the ultra, anti-feminist, (-abortion, -gay -immigration -EU) political party VOX you mention has been given leave to lead the private prosecution. For example, while the state bodies request top sentences of 25 years, VOX calls for 75. About the law being something open to change, there IS a constitutional path to what separatists want, but in 6.5 years they have NEVER spoken of it or tried it. It’s a tough, long political path, but it already exists, within the Constitution. However, they have chosen the civil disobedience path instead. It is a rightful choice, but one must be aware of its consequences. I almost didn’t recognize VOX in all those silly adjectives you wrapped around its name. I understand you have to try make your point, of course, even lying and twisting facts. I will not enter into rebating those as it is not the point of this discussion. However, VOX is not only directly involved but, as you may remember, is the body that started the proceedings not only against the perpetrators of 1-Oct but of many other actions by Catalan politicians which have already seen Artur Mas charged and found guilty of several crimes. That “quirk” you mention does not apply as it was VOX who started the proceedings. The crimes that VOX thought of bringing to the court bring a maximum penalty of 74 years altogether, so it is in their rights to ask for that penalty to be applied. There is nothing wrong in there, isn’t there? I bet if something wrong was done to you, yo would like to see the responsible people to have the maximum penalty, and not some slap in their wrist? Ed, I just called VOX what they call themselves, if you think that’s inaccurate … I don’t claim to be right, just to give food for thought. Really the problem is the Spanish constitution which guarantees the indivisibility of Spain. It’s impossible for this to be changed as long as the Senate is controlled by the PP / PSOE centralist parties. Catalunya will never be able to hold a legal plebiscite because this would be unconstitutional. Like I mentioned earlier, there IS a constitutional path to what separatists want, but in 6.5 years they have NEVER spoken of it or tried it. It’s a tough, long political path, but it already exists. “Catalunya will never be able to hold a legal plebiscite because this would be unconstitutional.” At the moment that is the case, yes. And that is exactly the question here: the fact that they did something wrong, and knowingly so. What political path are you talking about? With a senate that (like the US senate) is weighted towards the more conservative rural areas of Spain, what chance have Catalans got of modifying the Spanish constitution? ..therein lies the emotional appeal of a Punch and Judy Show, a spectacle which has delighted children for centuries… and adults too as we are seeing. PS: Legal question: how can a trial possibly be impartial when the Head of State has condemned the accused on national television, albeit before they committed the alleged crimes? PPS: If the Catalan nationalists really want dialogue, why did they not support Pedro Sánchez yesterday in the Spanish Parliament? Why did Catalan Nationalists vote side by side with the Spanish Right Wing ultra Nationalist PP to bring down a government which has chosen dialogue over confrontation? How can a trial possibly be impartial when the Head of State has condemned the accused on national television, albeit before they committed the alleged crimes? First consideration would be that, Spain being a true democracy, and one of the top ranked in the world, there is a full and complete separation of power between, Government, Parliament and the judiciary system. That will ensure that the trial is fair and not moved by the whims of the Government. The king, Head of the State, has no power whatsoever in Spain, and he can only pretty much do what he has done, which is make a speech on TV. Some crimes they stand accused of date way before Oct 1st. The king’s speech was (if memory serves me well) on October 3rd; it was not don’t before the crimes. were committed. If the Catalan nationalists really want dialogue, why did they not support Pedro Sánchez yesterday in the Spanish Parliament? Why did Catalan Nationalists vote side by side with the Spanish Right Wing ultra Nationalist PP to bring down a government which has chosen dialogue over confrontation? The Catalan nationalists do not want dialogue; they want independence. Whenever they come to a negotiation table, they will not about anything else other than independence, nor they will listen to any other proposals (financing, more power devolution, if there is anything left, …). They want to dialogue as much as a 3-year-old kid with a tantrum. The vote in the budget, the second one Sánchez has lost in few months, has been used as a political weapon. The government has rejected the 21 proposals (demands?) made by the nationalists (including the relator, etc, …) and that has triggered the rejection in their party. There is also a strategic game at play; with PSOE and Podemos loosing voters (in serious polls) and PP, Cs, and VOX going up, it is also very important to gauge where to call for elections, trying to revalidate some kind of majority which will allow him to remain in power. We have local, autonomic and European elections on May and calling a general election the same day or later could have been worse than calling it before. This may have been also the reason why the government has forced a no-vote in the budget. Lastly, and this is more an opinion, but well informed I’d think, Sánchez does not act like a statesman even by mistake. He is clever, I will not take that away from him, but he is only (and has always) acted on his own benefit, to the point of having a PSOE almost splitting in two. I’m reluctant to get into an argument with somebody like yourself who defends the very sinister VOX, a quasi fascist party like LePen in France. That VOX forms part of the “popular accusation” in this case – a legal mechanism peculiar to Spain which doesn’t exist in Scotland and which allows individuals or groups from society to take legal action against third parties even when they have not been affected in any way by the alleged crimes – is a disgrace to European democracy. As is this whole trial, which turns the clock back on European democracy. It’s not just about Spain. The reason, Ed, that the other 27 countries in the EU never use the law against politicians or in political related matters is that a) it is counterproductive to finding a political solution, and b) that it is very damaging for a democratic society which inevitably generates conflict and has established mechanisms to deal with these conflicts which are political mechanisms, not legal ones, and c) all politicians are by nature highly partisan figures and so “impartiality” in any legal trial is not even conceivably possible. The fact is, this problem was created by the Spanish right-wing to a large extent, by ultra Spanish nationalism. When Rajoy came to power in 2011, support for Catalan independence was at 11%. Rajoy refused to hold any talks with Puigdemont at all. He was never, ever interested in a political solution. On the contrary, anyone who knows Spanish politics knows that the Spanish Right-Wing have always reaped great electoral rewards from Catalan and Basque Nationalism… every action creates a reaction. This all happened back in the 1930’s in Spain when another Catalan President was locked up, and we all know how that ended. The thing is to open a dialogue, with no pre-conditions. According to the journalist Ignacio Escolar, a very brave and outstanding journalist in my opinion, the only reason the Catalan prisoners are being processed for Rebellion is because that is the only way they could be tried in Madrid. If they had been tried on the lesser charges of Disobeying Authority and the Misuse of Public Funds, which they may be guilty of, they would have been tried in the Catalan Supreme Court… and that would have been very different. And don’t try and tell me the Spanish judiciary isn’t totally politicized. Puigdemont declared it and then suspended it taking effect until a future date. Then he left the country. That’s not a Coup d’Etat as the Spanish establishment are saying. That’s a political stunt. 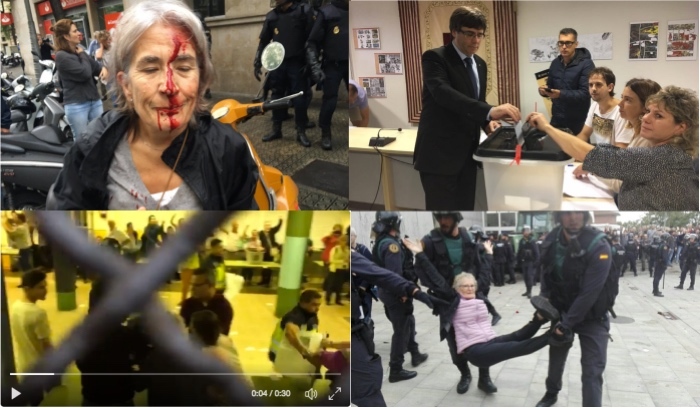 According to Spanish law, the same law which the Spanish establishment keep telling us they are trying to uphold, there must be violence to process someone for rebellion. The only violence there was on 1-O was police violence. Declaring the Republic in suspension is not rebellion therefore, because there was no violence. It is an open secret that Rajoy’s PP were hell bent on bringing the case to Madrid, it is also an open secret that the top tier of the Spanish justice system is totally politicized, and the German courts certainly saw no rebellion when they refused to extradite Puigdemont on those grounds. I think the Catalans nationalists are totally wrong to have done what they did back in 1-0: ethically wrong, politically wrong and legally wrong…. they have not behaved like democrats, much less like elected leaders who hold a public position of power and therefore have an even greater responsibility than ordinary citizens in behaving prudently, legally and democratically. “James Alexander”, you are lying, the Scottish Govt did not recognize the independent Catalan Republic. That is just a lie. No Scottish government would recognize any self-proclaimed Republic which could not muster even 50% backing from its population…. are you insane? The Scots are very democratic people. You’re on Bella Caledonia, a Scottish website, whose readers are politically informed, and follow the news, so it makes your lie a very, very stupid lie. You’re also lying when you say there was no police violence. Another total lie. The whole international media was there. Many of us have friends in Barcelona. We all know there was police violence and in fact, during the trial, the State Prosecutor has just justified the police violence as being necessary. So why are you lying “James Alexander” con tu inglés macarrónico? As for Scotland joining the EU, you are lying again. Both the PP and the PSOE have said they will not oppose an independent Scotland joining the EU, Foreign Ministers Datis and Borrell respectively. And why this sudden interest in the Spanish Constitution? Rajoy’s government passed a tax amnesty for Spanish PP tax dodgers which was ruled unconstitutional by the Spanish Constitutional court. Was anybody tried for that? The last time there was a coup in Spain, back in February 1981, one of the main organizers was the personal secretary of King Juan Carlos….And many of us are still waiting for the Spanish State to condemn the coup of July 18th 1936 which led to the Spanish Civil War, and the murder of Federico Garcia Lorca. I am sure that Spain will not oppose an independent Scotland in the EU, because three Spanish Foreign Ministers have said exactly that (Datis, Maragallo, Borrell), and because the rest of the EU would not accept a Spanish veto, not least because it goes against the founding principle of the European Union which is to unite the nations of Europe in a union. Also, at the practical level, the EU is made up of big countries like Spain and France and Germany, but also lots of small or medium sized countries like Latvia and Lithuania and Ireland and Holland sympathetic to other countries of a similar size like Scotland. All of these countries have a veto, just like Spain has a veto, and is Spain starts behaving like a spiteful, spoiled and truculent child by BULLYING not only Catalonia but also Scotland, then I think you will quickly find Spain is isolated. Like any good Spanish nationalist, you completely overestimate Spain’s importance. What, Spain is going to dictate EU policy on Scotland? Who do you people think you are? I think you’ll find that will not be acceptable to many EU countries whose support Spain needs on other matters of more importance. And I am glad to see that you agree that the Scottish Govt did not recognize the independent Catalan Republic at all as you had initially suggested. No doubt when the Scottish Govt refereed to “understanding and respecting” the Catalan Govern, they were referring in part to the deplorable and highly undemocratic behaviour of Mariano Rajoy who actually made an official government statement from La Moncloa, the Presidential palace on the eve of Scotland’s democratic independence referendum in September 2014 in a deliberate and cynical attempt to influence the result. And of course Spain is a democracy, the Spanish Constitution is a democratic Constitution, but it seems to work as a kind of a la carte menu for the Spanish Establishment, to be applied when it suits their interests. The Spanish Minister of the Treasury, Montoro, offered a tax amnesty for people who hadn’t paid their taxes, basically a large part of the Spanish establishment, though the full list of names has never been released. This tax amnesty offered a lower tax rate of 10% than the tax rate these fraudsters were supposed to pay. The Mafia apparently launders money at 12%. So the Spanish State under the criminal organization known as the Partido Popular and Rajoy offered a better deal for tax fraudsters than the Mob. Thanks to the diligent work of certain investigating Spanish magistrate judges, we now know that it would appear to be the case that senior PP politicians like Zaplana may have actually set up an international network which would have allowed criminals from all over Europe to launder dirty money through individual Spanish citizens at a discount rate of 10% through the tax amnesty offered by the Spanish State…. And then people like yourself, James Alexander, become indignant and outraged when we Europeans question Spain’s democratic credentials? In terms of the King of Spain, well what is he doing getting involved in politics? He is supposed to be above the political fray. With his address to the nation in October 2017 and his constant interventions since then – just last week for example – he has made it all but impossible for any future Spanish govt, of whatever political party, to negotiate with the Catalan nationalists… the King of Spain today, who was elected by nobody, is directly circumscribing the future actions of a democratically elected Spanish government…. and making a bad situation worse. With what right? One of the big differences between the UK and Spain is that British monarch ceased to have any involvement or influence over government policy or legislation – at least officially – in 1688 in the so called “Glorious Revolution” in which Parliament established itself as sovereign over any British monarch. This supremacy of Parliament over the monarchy was never established in Spain. Alfonso XIII, the Spanish monarch who abdicated and fled into exile in 1931, paving the way for the II Republic, was himself directly involved in drafting parliamentary legislation…. To see a monarch like Felipe VI getting involved in the daily politics of Spain is a total anachronism in XXI Europe. It is deeply undemocratic…. that is not the role of a monarch in a parliamentary democracy….